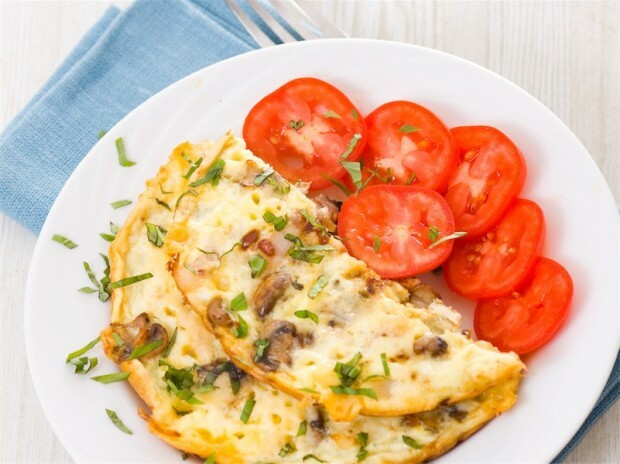 On the weekends I almost always make an omelet and this omelet with mushrooms and herbs is up there are one of my favorites. Stuffed with sauteed mushrooms, fresh herbs, and cheese it takes indulgent and delicious. Served with some fresh tomatoes for a complete and delicious meals. 1. Heat a non stick skillet over medium high heat. Add the mushrooms and cook for 3 minutes and then add the thyme, garlic, salt, and pepper. Cook for 3 more minutes and set aside. 2. Whisk together the eggs, milk, salt, pepper, parsley, and chives. 3. Add the eggs to the non stick pan over medium heat. Let cook mostly through and the flip to the other side. Add the mushrooms and cheese and fold in half to serve.